The Pentalogy follows the story of Adrian Howell who coincidentally shares the name of the author. (Henceforth if I refer to Howell I mean the author and Adrian, the character.) Adrian is just about thirteen years old in Book One: Wild-Born although because of his size most people think he is a lot younger. Throughout his younger years things just happened around him. Things fell off walls and shelves. Because it had always happened he thought it was normal. Until he went camping and people started to call him weird. Imbued with curiosity and the imagination of a young child he starts to experiment. Nothing really comes of it until he has an accident. Lying in hospital recuperating his returns, out of boredom, to his experiments. For reasons he can’t explain he simply can make things happen. Weakly at first he manipulates his environment. Then, out of hospital, his experiments become more ambitious to the delight of his younger sister, Cat. Adrian has absolutely no idea the consequences of this sudden power, but he is about to find out. He is tortured by headaches more painful than he has ever known. Then one night, a storm blows in and upsets the entirety of his life as he has known it. Howell’s YA Urban Fantasy has enough gore, conspiracy and heart to appeal to the maturer reader also. It is set within our world but there is a secret undercurrent of warring factions and Psionics in hiding from various threats. Between the spaces of reality a whole world exists where anything is possible. A man with nightmares so powerful it shakes the very ground and warps anything near him; a entire underground operation that captures and tortures psionics to death or insanity, and an unlikely family that find and save each other. There are many characters that populate just the first book, but each is rendered in such detail and with such empathy that regardless if they are a main character or a side character holding the door open for them on their way out, they feel as real and as tangible as anybody else. The real action starts when the source of Adrian’s headaches is explained. His whole world is turned upside down and a touching journey begins to bring his sister back to him. Howell maintains the pace without tiring the reader. Each setting is created with the same level of literary skill as the characters making for an entirely vivid read without getting too bogged down in the details. 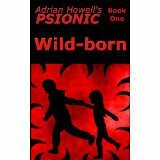 The Psionic series is entirely self-published by Howell and to date it is the best produced e-book I have seen. Not even a typo has managed to escape the author’s notice. It really is a pleasure to read a book that has had so much care taken over it.